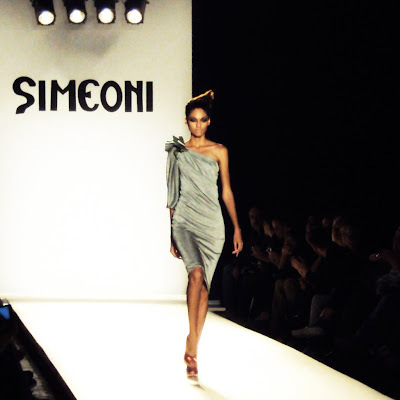 Simeoni is a greek brand created in 1996 by Thessaloniki-born Konstantinos Simeoni. The SS2011 show presented on Friday, October 15th started with a very impressive pose by our favourite model of this season, Gloria. Love to see more of her in the future! We saw lots of dresses in all types of metallic fabrics, from light golden shimmer to tin-foil-looking silver lamé. And the majority of them, with only one shoulder. A past trend about to make a comeback? The Internation Klein Blue soles of the dark blue pumps. Move over Monsieur Louboutin, red is so over! Two little bloggers-in-the-making in front row, shooting the show with their mobile phones. The new generation is already on us! 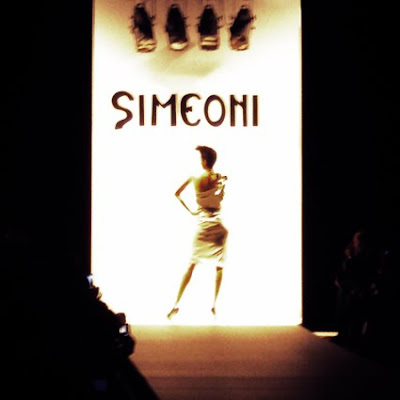 More Simeoni coverage over at Life Full of Fashion and Fashion Algorithms. ha ha! little bloggers rock! ;) hi hi hi, point taken! 2 little bloggers make nice title for a blog.You seem to have the time of your life this week!